[NEW SERVICE] I was eager to pay with Samsung Pay when I first got my Samsung Galaxy S7 Edge last year. For a while, I scored cheap thrills out of surprise expressions of the cashier when I tapped my phone instead of a card with Visa PayWave and MasterCard PayPass (magnetic cards) and feeling so state-of-art about it. Naturally, some months later I don't feel the thrills and as well started to forget about Samsung Pay altogether. Especially because not all cashiers are equipped with PayWave or PayPass, thus I always have to have the physical credit cards (those that are already in my Samsung Pay) in my wallet, and the first instinct is to draw the physical card instead of Samsung Pay. So for months, I did not make a single Samsung Pay transaction. Until last week, I got a pop-up titled "Samsung Pay Rewards". Well hello again, Samsung Pay! The program essentially offers accumulated points via each transaction regardless of the payment amount. 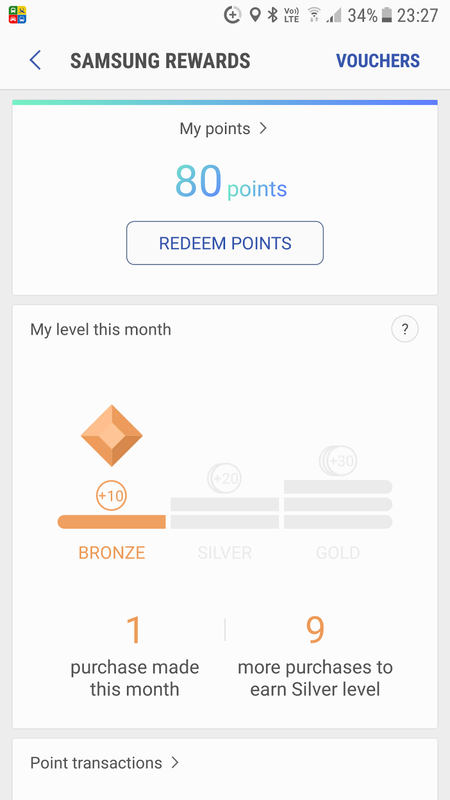 Based on the number of payments made each month, the points accumulated will be given on a tier basis, for example, the start out level is Bronze, one tap gives 10 rewards points, no matter how much you paid. I guess for consumers like me that always liked a little extra for my money paid, such reward program does entice me. 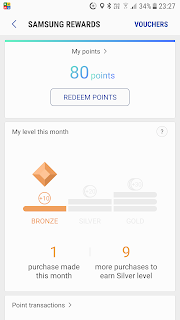 That said, there are very little options redeemable with the Samsung reward points at the moment. There are the Wheels of Rewards, pay 10 Samsung Rewards points to spin for a pair of Liverpool vs. Manchester tickets or redeem 600 points for a Samsung wireless charger or redeem 1,000 points for $5 Grab voucher. Decent, though it will take a while to accumulate the points redeemable for something. What is surprising is that I did not see a single advertising material about this new Samsung Rewards program except in the Samsung Pay app itself. Probably coming soon then!